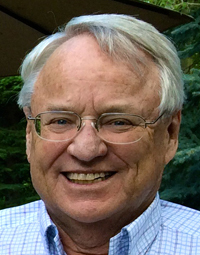 Bill Syms, 64, of Boise, passed away of natural causes in his home in Boise, Idaho. He was born in Fort Lauderdale, Fla., on June 12, 1950, to Patricia and Bill Syms. Bill spent many of his early childhood years vacationing with his family in Ketchum, Idaho. After graduating from Idaho State University, he went on to earn his master’s degree at the American Graduate School of International Business. He and his wife Gerry then moved to Amsterdam, where he began his working career on an international level, and they began their family with the birth of their first son, Billy. After returning to the United States, their second child, Carson, was born with severe mental and physical handicaps. They eventually settled in Boise, Idaho, and completed their family with the birth of their daughter, Ashley. Bill joined Simplot, where he held several positions and worked to expand the company’s business in Asia. In 1991, he capitalized on an opportunity to expose his children to international life and travel by accepting a position and moving the family to Hong Kong. In 1994, they returned to Idaho again, where later Bill went on to work for the Idaho Potato Commission. Bill was an amazingly loving father and dedicated family man. His 15-year relationship with his handicapped son Carson was especially profound, deep and caring. Bill was a true animal lover and often visited and volunteered at the Humane Society, where more than once he brought home a new family friend. Bill was a world traveler who sought out new adventures for both work and fun, but was most “at home” in Copper Basin with a fly rod in his hand. Bill is survived by Gerry Syms of Boise, Idaho; his son, William Joseph Syms IV and wife Shannon of Danville, Calif.; his daughter Ashley Syms and her partner Pam Proto of Boulder, Colo.; his three grandchildren: Kinsley, Kelton and Dolla; his siblings, Chris Syms and wife Mary Ann, Kevin Syms and wife Jeffra, Patti Miller and husband Louis, and Scott Syms; several nieces and nephews; his stepfather Bob Gwinner and stepmother Nancy Syms. Bill was preceded in death by his father William Joseph Syms II, his mother Patricia Gwinner, and his son Carson Syms. In lieu of flowers, please make memorial contributions to The Idaho Humane Society. Services for Bill took place at St. Mary’s Church on Monday, July 7, 2014. The family wishes to thank all those who touched Bill’s life in so many wonderful ways. Whether your memories of him are few, or they span a lifetime, we are truly grateful for all that you added to his life. Memories and condolences may be shared with the family on Bill’s memorial webpage at www.summersfuneral.com.